In 1994,2 six creationist scientists answered ‘Yes’ to these questions. They agreed that the continents really have moved apart during the Flood of Noah. And they moved quickly over months, not slowly over millions of years. The details of their answer were presented in papers at the International Conference on Creationism, Pittsburgh, Pennsylvania.3–5 This catastrophic-plate-tectonics model is regarded by many as the most highly developed creationist model of the global Flood. However, a number of creationist geologists are sceptical of the assumptions of plate tectonics and have published papers and monographs expressing their concerns.6 In view of the significance of geology to a Biblical understanding of Earth history, we believe it is important that these differences be explored in a forum. This forum, therefore, focuses on the three papers presented at the 1994 International Conference on Creationism. The participants are John Baumgardner and Michael Oard, who represent the ‘for’ and ‘against’ position respectively. Both have published extensively on Biblical geology. Each has drawn on the advice of others with the aim of making their contribution representative of the different views. Those who assisted are acknowledged at the end of the last contribution of each author. The forum proceeded in three stages. First, each author prepared a paper setting out his case, either ‘for’ or ‘against’. The first submissions were exchanged and then each author prepared a response. The second submissions were exchanged and each author then prepared his third and final submission. We publish all the articles in this issue of TJ. Although the ‘for’ position is presented first, it is important to realise that the ‘for’ and ‘against’ positions for each of the first, second and third submissions were prepared simultaneously. Over the years, creationists have developed a number of models of the worldwide Flood. Secular geologists also have developed different models for how they think geological history took place. Forty years ago, hardly any geologists believed in continental drift. Now, almost all geologists do. Geology is important because all models of Earth history depend upon it. The fact that creationist scientists have different views on this topic should be seen as positive. After all, the Earth is immense and our data are very limited in space and time. Christians should not be surprised if some questions are still open. The important thing is that the issues are being worked through. This is science at its best—exploring different options with an open mind. That is why we always stress that Christians should never put their faith in one particular scientific model, whether it is geological, biological or astronomical. Models change as ideas change and as people come and go. Rather, we put our faith in the infallible Word of God, the Bible, which does not change because it is true. We hope you enjoy the forum and that it helps you appreciate something of the mammoth job of reconstructing a geological history of the Earth. That task is difficult, even when we have the broad parameters clearly specified in the Bible—parameters such as the Flood’s magnitude, its duration and its extent. by John R. Baumgardner Is catastrophic plate tectonics part of Earth history? by John R. Baumgardner Does the catastrophic plate tectonics model assume too much uniformitarianism? Batten, D. (Ed. ), Catchpoole, D., Sarfati, J. and Wieland, C., Chapter 11, What about continental drift? The Creation Answers Book, Creation Book Publishers, 2006. Return to text. 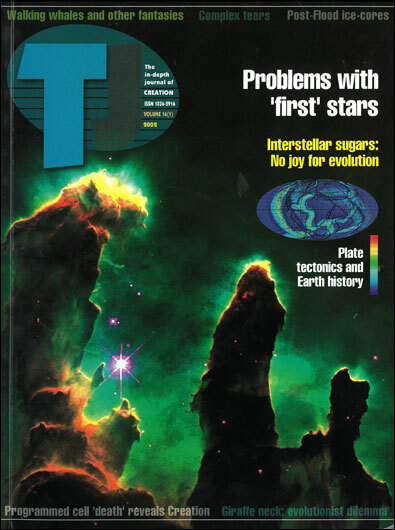 Although significant papers on catastrophic plate tectonics were presented in 1994, the idea was first presented by John Baumgardner at the 1986 International Conference on Creationism, Pittsburgh, Pennsylvania. He added details to the concept at the 1990 ICC. Return to text. Austin, S.A., Baumgardner, J.R., Humphreys, D.R., Snelling, A.A., Vardiman, L. and Wise, K.P., Catastrophic plate tectonics: a global Flood model of Earth history; in: Walsh, R.E. (Ed. ), Proceedings of the Third International Conference on Creationism, Creation Science Fellowship, Pittsburgh, pp. 609–621, 1994. Return to text. Baumgardner, J.R., Computer modelling of the large-scale tectonics associated with the Genesis Flood; in: Walsh, RE (Ed. ), Proceedings of the Third International Conference on Creationism, Technical Symposium Sessions, Creation Science Fellowship, Pittsburgh, pp. 49–62, 1994. Return to text. Baumgardner, J.R., Runaway subduction as the driving mechanism for the Genesis Flood; in: Walsh, RE (Ed. ), Proceedings of the Third International Conference on Creationism, Creation Science Fellowship, Pittsburgh, pp. 63–75, 1994. Return to text. For example, Reed, J.K. (Ed. ), Plate Tectonics: A Different View, Creation Research Society Monograph 10, St Joseph, pp. 11–23, 2000. Many other such references are cited in the forum. Return to text.